Renowned American landscape photographer Clyde Butcher, known for his large-format film photography of the Everglades and natural sites throughout the world, and his wife, Niki, present their newest collection, "The Natural World Along Tamiami Trail," during an open house at the Ochopee, Fla. gallery. 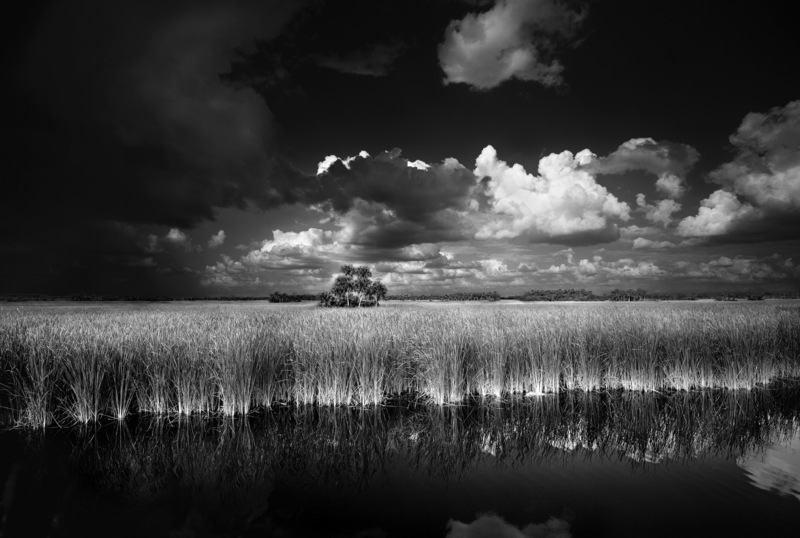 With this stunning history-in-the-making collection, the husband-and-wife team encourages viewers to embrace the natural beauty that exists along the Tamiami Trail through Clyde's powerful black-and-white images. Niki's different perspective captures images with wayside attractions and old Florida architecture. Free and open to the public, attendees will have the opportunity to view their latest collection on Saturday, March 5 and Sunday, March 6 from 10 a.m. - 5 p.m. at 52388 Tamiami Trail in Ochopee. The down-to-earth and candid Butcher will speak to guests and sign books at the open house. The Butchers have lived in the Big Cypress National Preserve for 20 years. The inspiration behind this collection dates back to their drives back and forth along the Tamiami Trail - always with cameras in hand to capture moments and record history. The images in this exhibit were photographed using a large-format 8-inch by 10-inch view camera. The quality of the photo negatives persuades the viewer's eye to look closer at the intricate detail of the natural world. The Clyde Butcher Big Cypress Gallery is located at Highway 41 Tamiami Trail (mile marker 54.5) in Ochopee, Fla. For more information on the upcoming fundraiser, visit http://www.ClydeButcher.com or call 239-695-2428. For the last five decades, Clyde Butcher’s black and white photographs have preserved untouched areas of the natural landscape on film. He is known for images he captured using large-format cameras that allowed him to express the elaborate details and textures of the landscape. Today, Butcher uses a digital camera to produce sharp prints that also tell the story of the beauty and drama of the natural world. Butcher has worked on projects for the Florida Department of Environmental Protection, Everglades National Park, Rocky Mountain National Park, the Audubon Society, The Nature Conservancy, River Keepers and the Wilderness Society. Clyde has been honored by the state of Florida by being inducted into the Artist Hall of Fame, the highest award that can be given to a private citizen. He has received the Lifetime Achievement Award from the North American Nature Photography Association. He was awarded the Heartland Community Service Award from the state of Florida for educating the people of Florida about the beauty of their state. The Sierra Club gave him the Ansel Adams Conservation Award, awarded to a photographer showing excellence in photography who has contributed to public awareness of the environment. Butcher’s photography can be seen at his Venice gallery and his Big Cypress gallery, located on 13 acres in the center of the Everglades in the Big Cypress National Preserve. For more information, please visit http://www.ClydeButcher.com.